Richard Torrenzano is chief executive of The Torrenzano Group, a reputation and high-stakes issues management firm specializing in building and protecting corporate reputations, helping clients grow their business and enhance brand and shareholder value. 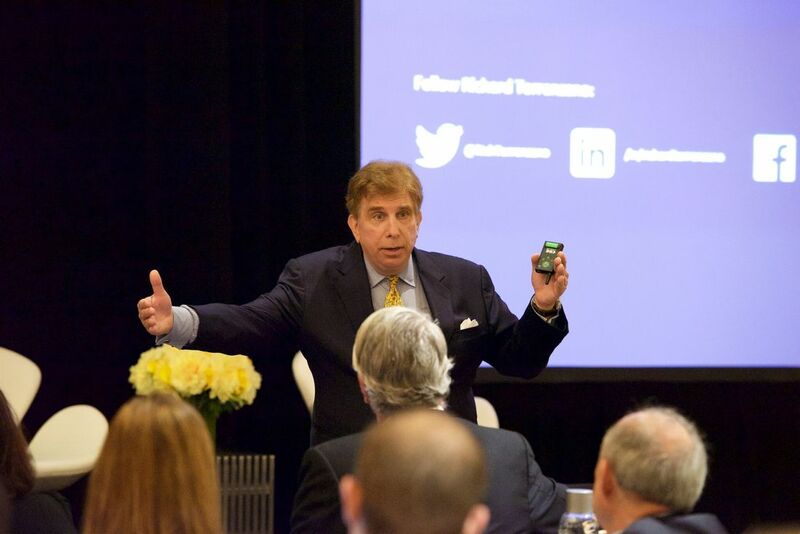 ​The Torrenzano Group helps organizations take control of how they are perceived™. ​Richard is a sought-after expert and leading commentator on crisis, brands, reputation and social media. Read an Interview with Richard Torrenzano on Crisis Management. Digital Assassination reveals how the Internet is used to destroy brands, reputations, even lives. It exposes strategies digital assassins deploy and defines ways to turn the tables on their deception. It offers a roadmap to what is happening on the Internet, why it is happening and what you can do about it. Rich has counseled chief executives and boards of corporations in the United States, Europe, Asia and Latin America, as well as several heads of state. He has extensive hands-on experience in the world’s financial markets. Throughout a period of rapidly developing public policy issues, historic levels of market activity, unprecedented change in world affairs and intense media coverage, Rich planned and directed the New York Stock Exchange’s worldwide activities and programs. For nearly a decade, he was a member of the Big Board’s Management (policy) and Executive (operations) Committees. And on the firing line as the NYSE’s chief spokesman, he had a unique vantage on business, industry and media. Rich developed public strategies to deal with significant market issues, including: Insider trading scandals; corporate mergers, acquisitions and IPOs; governance and shareholder activism; high-frequency trading; restructuring as well as regulatory and disciplinary actions. He managed some of the most visible global corporate crises in our lifetime, including: The October 1987 market crash, and Federal Reserve Bank’s $4 billion recapitalization of Long-Term Capital Management, financed by a consortium of 14 of the world’s largest financial institutions. His actions and work helped restore confidence in capital markets. Following the September 11th attacks, he provided counsel to leadership at Merrill Lynch, Lloyd’s of London, Nasdaq Stock Market, American Stock Exchange, National Association of Securities Dealers and Security Traders Association — all significantly affected by the terrorism raids. As a top corporate officer, Rich made a specialty of identifying emerging issues and managing responses for: brand, reputation and cyber-attacks; hacking and computer breakdowns; product tampering, recalls and liability; unexpected management and board changes; fires, bomb threats, protests, kidnappings and terrorism; as well as regional, federal and international government oversight commissions, investigations, studies, testimony and rulings. Following the Bush-Gorbachev Malta Summit, Rich negotiated and planned the landmark NYSE USSR-US Moscow seminar on financial markets. It was attended by several hundred Soviet academic, business, financial, and government leaders. The program served as a catalyst for the opening of exchanges in Moscow and St. Petersburg. At that time, Rich was also part of the delegation that advised key political and business leaders in Czechoslovakia, Hungary and Poland on their transition to capitalism and opening of financial markets. He also negotiated and planned the historic China-US symposium on financial markets in Beijing. That government and business conclave galvanized the opening of the stock exchange in Shanghai, moving China towards a new economic and entrepreneurial environment. Prior to those activities, Rich coordinated White House-related activities for the NYSE CEO in his capacity as chairman of President Reagan’s Board of Advisors on Private Sector Initiatives. Rich was director and senior vice president, corporate affairs and a member of the Executive Management Committee for SmithKline Beecham, Plc. SB, a leading global healthcare company, marketed more than 300 products in 130 countries and had revenues of $14 billion. SB merged with Glaxo. Based in London, he had worldwide responsibility for government affairs and public policy, communications and investor relations, issues and industry relations, and philanthropic activities. Under his leadership, during an intense political climate in healthcare, corporate affairs was re-energized through management changes, deployment of technology and integration of strategic plans — all of which enhanced and strengthened SB’s global policy reach. Rich was awarded The Ellis Island Medal of Honor and has been recognized by several distinguished international organizations. He is a Knight of Malta; Knight Grand Cross, Order of the Holy Sepulcher; Knight, Order of Merit, Republic of Italy; Knight Commander Jus Patronato, Sacred Military Constantinian Order of St. George, and Knight Grand Cross, Royal Order of Francis I, both Royal House of Bourbon; Knight Commander, Order of Saints Maurice and Lazarus, and Knight Commander, Order of Merit, both Royal House of Savoy. He is the recipient of several professional awards, including two Public Relations Society of America’s Silver Anvils for institutional and investor relations programs. Rich serves on the board of the New York State Trooper Foundation, and is member of the Economic Club of New York and National Press Club, Washington, DC. For several years, he served on the Private Sector Advisory Committee, United States Information Agency, State Department, Washington, DC. He received a bachelor’s degree in behavioral sciences from the New York Institute of Technology and served on the university’s board of trustees and its executive committee for more than twenty years. Rich holds NYIT’s two highest honors: president’s medal for outstanding service to the community and an honorary Doctor of Letters. He completed the executive program of the Graduate School of Business, Stanford University, California. He is an avid sailor and outdoorsman. Richard Torrenzano is a sought-after expert and leading commentator on crisis, brands, reputation and social media. His talks and text direct leaders to conquer competition in this era of intense government and public scrutiny, media proliferation and hype. He combines experience — managing some of the most visible global corporate crises in our lifetime, from market crashes, cyber-attacks, recalls to terrorism — with exclusive behind-the-scenes insights of current events and history to reveal actions and leadership necessary to master escalating digital dangers, risks and threats. With businesses under attack — as surprising social media magnifies customer, employee, investor, media and regulator negative perceptions — he describes actions and leadership necessary to master escalating digital dangers, risks and threats.